This & That: Somebody Loves... my blog! Toot Toot! Yep, that is the sound of my own horn. If you look to the right, you will see a list of Blogs I Love, it's more than love really... I sort of stalk them. I look at each almost daily. All are blogs with a purpose (unlike this one), two are about photography, one is about sewing, one has sewing and inspirational posts, and one is just fun to look at! 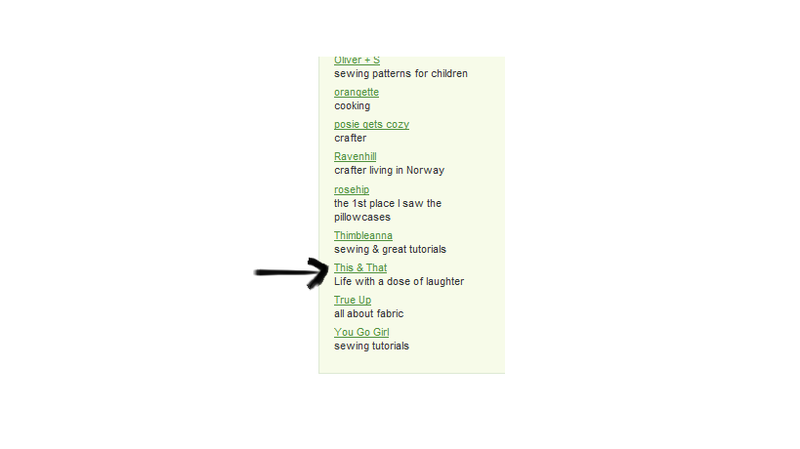 So imagine my surprise when within one of those blogs I saw MY BLOG listed under blogs she loves!! Keep your posts coming, I want to see a photo deluge. As of now, I have 2 projects that I am piecing together inspired by your blog. Hope you are patient, they could take me awhile.